Sophia Lindop can always be relied upon to come up with something exciting to go with my wine of the day. We try and do the unusual and match foods to wines which might not always be top of mind. Here the Miss Molly MCC is a great aperitif which you take on to the first course of the meal. To make the pastry, place the butter in a small bowl and beat well with a spatula until it is very soft and creamy. Sift the flour onto a work surface and make a well. Add the salt and water to the well and mix it into the flour using your fingertips. Add the egg yolk and softened butter and work the ingredients together with your fingertips to form a soft dough. Knead very lightly before forming a ball. Line a clean dishcloth with flour and wrap the pastry in the cloth before leaving to rest in a cool place for at least 2 hours or overnight. Preheat the oven to 180°C. Roll out the pastry on a lightly floured surface and lift onto a 30 cm loose-bottomed tart tin. Press the pastry down without stretching it too much. Prick the bottom with a fork and bake blind for 15 minutes. Remove from the oven and allow to cool. Turn the oven temperature up to 200°C. Cut a cross in the bottom of the tomatoes using a small, sharp knife. Cover them with boiling water and leave for about 10 to 15 minutes. The skin should now slide off easily. Discard the skin and cut the tomatoes into slices. Sprinkle them with salt and allow them to drain in a colander. In a saucepan, heat the olive oil and add the onions and bacon. Cook over a moderate heat for about 15 minutes until the onions are soft and golden, stirring frequently. Add the sugar, garlic, canned tomatoes and tomato paste and simmer for 10 minutes until slightly reduced. Stir occasionally. Remove the saucepan from the heat and allow to cool a little. Whisk the eggs lightly in a bowl, season with salt and pepper and add the oregano. Stir this into the tomato mixture in the saucepan. Spread the filling in the pastry case. 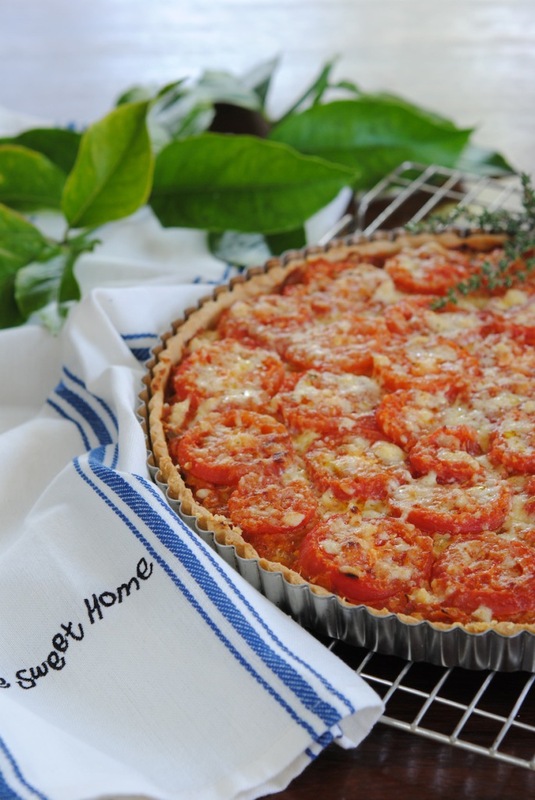 Arrange the drained tomato slices neatly on top and sprinkle with the grated Gruyère. Bake for 30 minutes. Remove from the oven and allow to cool for a few minutes before serving. Serve with a garden salad as a light meal, or on its own as a starter. Note: The pastry can be kept for 2 to 3 days in the refrigerator, or for up to a month in the freezer. Allow plenty of time for the dough to return to the temperature of a ‘cool place’ before using.